A veteran Chinese dissident, Zhu Yufu, has been charged with subversion for writing and publishing a poem on the internet, according to his lawyer. The poem, entitled It's Time, urged people to gather in support of freedom. Mr Zhu's lawyer said no date had been set for the trial. Chinese officials have not commented on the reported charge. 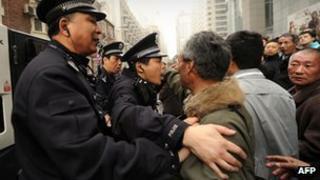 Mr Zhu was formally arrested last April as China began a wide-ranging clampdown on dissent. The lawyer, Li Dunyong, said he had collected the indictment on Monday from a court in the eastern city of Hangzhou. He told Reuters news agency he had met Mr Zhu, who he said was "in a good condition". Zhu Yufu, who is from Hangzhou, is a veteran activist who was involved in the 1979 Democracy Wall movement, which pressed for a quicker pace of change in China. He has been jailed twice before for his activism - in 1999 for seven years and in 2007 for two years. The Chinese authorities formally arrested Mr Zhu in April 2011 for inciting subversion of state power - a charge often used against critics of the Communist Party. A verse of his poem reads: "It's time, Chinese people! / The square belongs to everyone / the feet are yours / it's time to use your feet and take to the square to make a choice." But Li Dunyong said Mr Zhu was not connected with internet appeals for rallies inspired by uprisings in Arab countries. Chinese police rounded up dozens of dissidents in response to those calls; but the rallies themselves were tiny, with participants outnumbered by security officials. China's Communist leaders have been stressing the need for stability ahead of a leadership change later in 2012. The authorities have continued to detain and question large numbers of activists and lawyers. In December 2011 the prominent Sichuan writer and political activist, Chen Wei, was sentenced to nine years in prison for inciting subversion. Days later, the veteran Guizhou dissident, Chen Xi, received a 10-year sentence on the same charge.